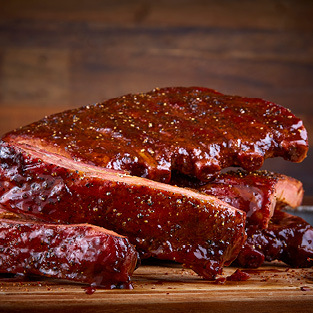 Nothing satisfies like tasty, succulent barbecued ribs! You will love these spicy, mesquite-smoked morsels…they are specially seasoned then slow smoked to perfection. You will receive only the choicest cuts in these “St. Louis style” ribs. This special gift is topped of with our Ranch House Barbecue Sauce. Serves 3-4 generously. Barbeque Pork Ribs, Size Approx. 3 lbs.